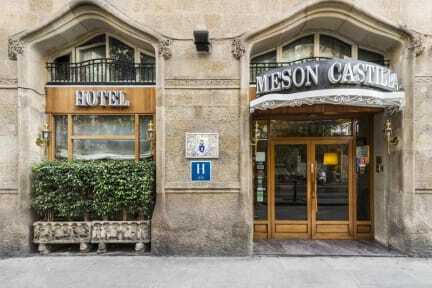 Meson Castilla Atiram Hotel i Barcelona, Spania: Bestill nå! The hotel lies in the city centre in a quiet area, 100 meters from Plaza Cataluna and Plaza Universidad. It has a charming family atmosphere. All rooms are fully equipped and have been furnished with hand painted Catalan style furniture. Our hotel occupies the first floor of a stately building and has its own car park. Beautiful bedroom furniture, decorated with hand painted Olio motifs. 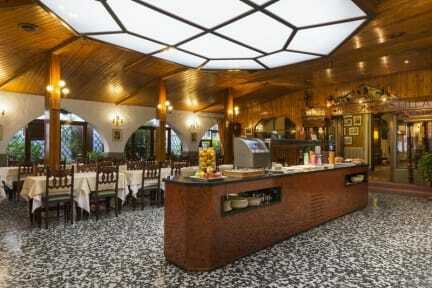 Delightful breakfast room with a spacious terrace and buffet service. The hotel offers 57 rooms with air conditioning, business facilities, car parking, currency exchange, elevator, laundry service, multilingual staff, a safe at the reception and shops nearby. Magnificent garden where, on warm spring and summer mornings, you will be able to enjoy our breakfast buffet.